The 8th Foot arrived in Canada in 1768 and had its ten companies dispersed to garrison isolated posts on the Great Lakes: Fort Niagara (four), Fort Detroit (three), Fort Michilimackinac (two), and Fort Oswego (one). As the regiment's deployment appeared to near completion, protests in the eastern colonies began to intensify, evolving from vocal concerns about self-determination and taxation without representation, to rebellion against Britain in 1775. During its posting, the 8th Foot possessed a number of officers adept in cultivating a relationship with tribes on the Great Lakes, notable amongst them being Captain Arent DePeyster and Lieutenant John Caldwell. Later to become 5th Baronet of County Fermanagh's Caldwell Castle, Caldwell immersed himself in his efforts to foster understanding between the British and Ojibwa, reputedly marrying a member of the tribe and becoming a chief under the adopted name of "The Runner". In the west, Captain DePeyster's negotiations proved instrumental in maintaining peace between the British and tribes such as the Mohawk and Ojibwa nations. Born into a prominent New York City family of Dutch origin, DePeyster held authority over Fort Michilimackinac. In 1778, using £19,000 of goods as leverage, he arranged for more than 550 warriors from several tribes to serve in Montreal and Ottawa. The invasion of Canada by American generals Richard Montgomery and Benedict Arnold began in mid-1775. By the end of November, the Americans had captured Fort St. Jean, Montreal, and Fort Chambly, and besieged the city of Quebec.An attempt to storm it in December resulted in Montgomery's death. Reinforcements from Europe raised the siege in May 1776 and expelled the almost starved and exhausted Americans from the area. After the lifting of the siege, a small party from the 8th Foot led the regiment to its first significant battle in the war. From Fort Oswegatchie, Captain George Forster, of the regiment's light company, led a composite force, including 40 regulars and about 200 warriors, across the St. Lawrence River to attack Fort Cedars, held by 400 Americans under Timothy Bedel. Forster maintained illicit contact with occupied Montreal,and received intelligence of American troop movements using Indian operatives and Major de Lorimier. On arriving at the fort on 18 May, the British briefly exchanged fire before Forster parleyed with Bedel's successor, Major Isaac Butterfield, to request his surrender and warn him of the consequences should Indian warriors be committed to battle. Butterfield, whose men had apparently been disconcerted by an earlier display of Indian war chanting, expressed a willingness to do so on the proviso of being allowed to retire with his weapons - a condition that Forster refused. Butterfield conceded the fort on the 19th, on the day an American relief force of about 150 resumed its advance on the Cedars, having previously reembarked aboard bateaux because of exaggerated scout reports.Once he learned of the column's presence, Forster had a detachment ambush the Americans from positions astride the only available path through the forest.The relief's commander, Major Sherburne, surrendered, but the engagement infuriated the Indian contingent as the Allies' only fatality was a Seneca war chief. Forster managed to dissuade them from executing the prisoners by paying substantial ransoms for some of the captives as compensation for the loss. Emboldened by the two victories, the British landed at Pointe-Claire, on the Island of Montreal, only to withdraw after Forster established the strength of General Benedict Arnold's force at Lachine. In pursuit of a dwindling column, Arnold followed the British using bateaux, but was deterred from landing by Forster's placement of men along the embankment at Quinze-Chênes, supported by two captured cannon pieces. On the 27th, Forster sent Sherburne under a flag of truce to inform Arnold that terms to a prisoner exchange favourable to the British had been agreed upon. Arnold accepted the conditions, with the exception of Americans being forbidden from serving elsewhere. Both Arnold and Forster had postured during the battle, each threatening the other with the prospect of atrocities: the killing of prisoners by Forster's Indian allies and the destruction of Indian villages by Arnold's men. The exchange would be denounced by the American Second Continental Congress and the arrangement reneged upon under the pretext that abuses had been committed by Forster's men. In late July 1777, the regiment contributed Captain Richard Leroult and 100 men to the Siege of Fort Stanwix. Commanded by Lieutenant-Colonel Barry St. Leger, 34th Foot, the force ambushed the American troops at the Battle of Oriskany in August 1777: however a few weeks later the siege collapsed with the disappearance of the dis-spirited native allies. The regiment took part in further actions at Vincennes and the Battle of Newtown (Elmira, New York) in 1779, as well as the Mohawk Valley in 1780 and Kentucky in 1782. Captain Henry Bird of the 8th Regiment led a British and Native American siege of Fort Laurens in 1779. 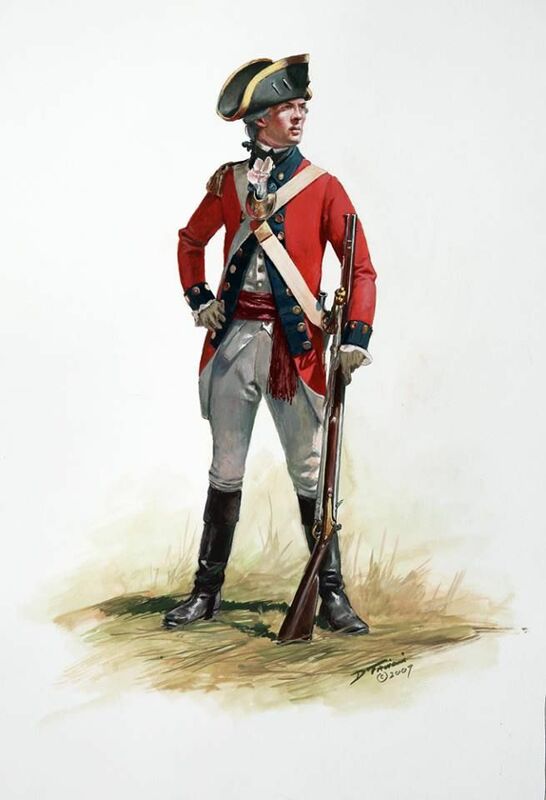 In 1780, he led an invasion of Kentucky, capturing two "stations" (fortified settlements) and returning to Detroit with 300 prisoners.The regiment returned to England in September 1785.